Ernest Rangel Number Eight Turquoise Row Bracelet size 8"
Navajo silversmith Ernest Rangel is best known for his sandcast work. Carving molds from tufa (a type of limestone), he then embellishes his pieces with decorative aspects and various stones or coral. This is an exceptional bracelet by Ernest Rangel. 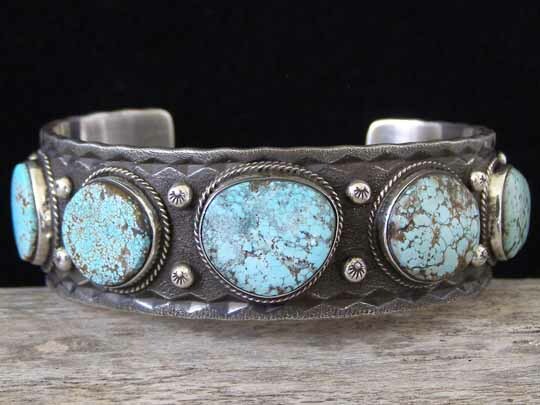 Made from hefty 12 gauge Sterling, this cuff forms a sturdy foundation for these five exceptional stones of natural, untreated Number Eight turquoise from Nevada. Ernest punctuated the face of this cuff with raindrops stamped with tiny scallops while deep, diamond-shaped stampwork indentations mark the edges of the cuff. The stipled surface of the cuff is heavily oxidized to form a dark background. At the terminals, Ernest added Four Directions motifs highlighted by twist wire scrollwork. The same diamond stamp used to decorate the edges of the cuff was used to form a patterned equatorial line of stampwork inside the cuff. This is a wonderful, hefty cuff with fine natural turquoise in a very rare large size! Hallmarked with an R inside of an arrowhead and stamped Sterling inside. Stone: center 13/16" x 11/16"; left 11/16" x 5/8"; right 3/4" x 11/16"; far left 5/8" x 5/8"; far right 5/8" x 5/8"
Terminal to terminal: 6 5/8"
Total inside circumference (including gap): 8"